Stuttgart. Porsche continues to achieve high levels of performance over the long term. The new Panamera Turbo S E-Hybrid sees the sportscar manufacturer launch a plug-in hybrid model as the flagship of a model line for the first time. The four-liter V8 engine from the Panamera Turbo is combined with an electric motor, resulting in 680 hp of system power and outstanding power delivery: Even when just above idle speed, the Panamera Turbo offers an 850 Nm of torque. That means it accelerates from zero to 100 km/h in 3.4 seconds and reaches a top speed of 310 km/h. The boost strategy of the all-wheel drive Panamera comes from the 918 Spyder super sportscar. 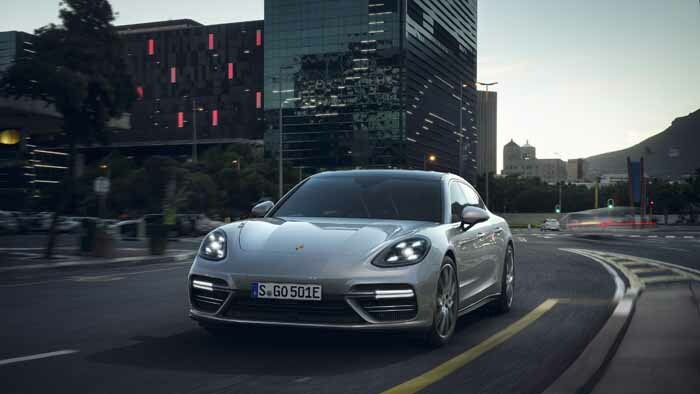 In the New European Driving Cycle, the average fuel consumption is 2.9 l/100 km, and the new flagship Panamera can drive on fully electric power for up to 50 kilometers. The Panamera Turbo S E-Hybrid underlines the high importance of electromobility to Porsche. After the successful début of the Panamera 4 E-Hybrid, which uses a V6 engine together with an electric motor, Porsche is showing once again that hybrid technology has great performance potential. The new Panamera Turbo S E-Hybrid combines an electric motor (136 hp) with a V8 engine (550 hp). The decoupler installed in the Porsche hybrid module is actuated electromechanically by an electric clutch actuator (ECA), just like in the Panamera 4 E-Hybrid. The result is short response times and a high level of comfort. As in all other second-generation Panamera models, the fast-shifting Porsche Doppelkupplung (PDK) with eight gears is used to transmit the power to the standard adaptive all-wheel drive system Porsche Traction Management (PTM). The E-Performance drive accelerates the luxury saloon to 100 km/h in just 3.4 seconds and provides extraordinary tractive force at higher speeds. Combined with a top speed of 310 km/h, this means that the Porsche Panamera Turbo S E-Hybrid sets yet more new benchmarks in its class. The Panamera Turbo S E-Hybrid comes with air suspension as standard and offers a unique balance in this segment: the comfort of a luxury saloon paired with sportscar-level performance values. The electric motor is supplied with power via a liquid-cooled lithium-ion battery with an energy capacity of 14.1 kWh. Within six hours, the high-voltage battery integrated in the rear is fully charged with 10 A via a 230-V connection. If the Panamera uses the optional 7.2-kW on-board charger and a 230-V connection with 32 A instead of the standard 3.6-kW charger, the battery is fully charged in just 2.4 hours. The charging process can also be started using a timer via Porsche Communication Management (PCM) or the Porsche Connect app2) (for smartphones and Apple Watch). Moreover, the Panamera Turbo S E-Hybrid is fitted with auxiliary air conditioning to cool or heat the passenger compartment even during charging. Performance, comfort and efficiency form a perfect three-way combination: The Panamera Turbo S E-Hybrid starts in the purely electric “E-Power” mode as standard, and the four-door sportscar drives locally over a distance of up to 50 kilometers with zero emissions. When a specific pressure point is passed in the accelerator pedal, or when the battery charge level drops below a minimum value, the Panamera switches to “Hybrid Auto” mode, at which point the power of both engines is available. Consumption in the New European Driving Cycle (NEDC) for plug-in hybrid models amounts to 2.9 l/100 km for super-grade petrol (66 g/km of CO2) and 16.2 kW/h/100 km for electric power. The new flagship of the second Panamera generation will be launched in the Asia Pacific market by the end of 2017. The Panamera Turbo S E-Hybrid is celebrating its world première at the Geneva Motor Show (March 7 to 19, 2017). From the very beginning, the four-door Gran Turismo will also be offered in an Executive version, with a wheelbase extended by 150 millimeters.